First published in 1974, Kundalini Yoga Sadhana Guidelines has become the best selling Kundalini Yoga manual of all time. Within these pages we hope you'll find something that inspires you to keep returning again and again, breath-by-breath, to your Self and to your practice. -A comprehensive history of the sadhanas Yogi Bhajan gave over the years. 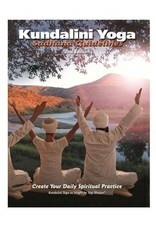 Kundalini Yoga Sadhana Guidelines provides great ideas for building your own personal spiritual practice. What would your life look life if you were to experience discipline in this way? Open these pages and begin the journey of a lifetime.